Every astrologer has done this at some point in their career; given a really good reading to someone and then realized that the chart was wrong! It happened to me just the other day and I could of course blame Mercury for being combust and having turned retrograde (on my Uranus none the less), but maybe I should just admit that I was just careless. Now it wasn’t the birth data that I got wrong, but the consultation chart. I have been using consultation charts for a long time now. I always set the chart for the time that the appointment is made. I have found that coupled with: solar return, profections, progressions and naturally the birth chart itself, the consultation chart is a mine-full of information. So last week I set the consultation chart for a regular client; I knew about the issues and situation she had been dealing with in recent times. 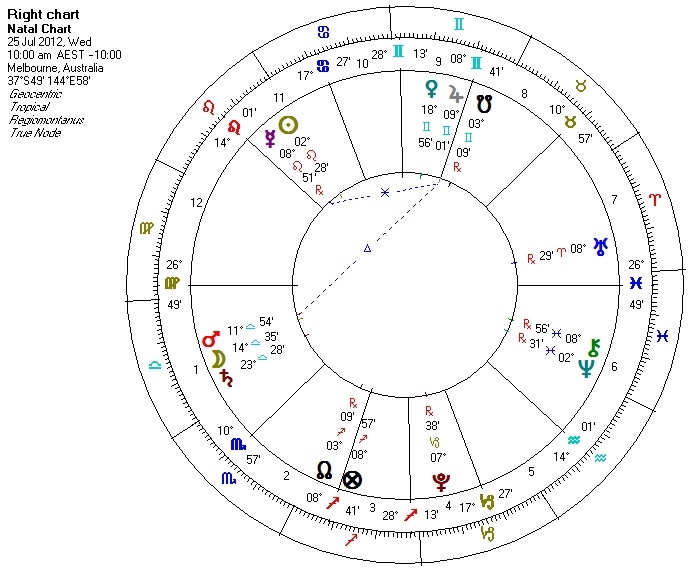 Looking at the consultation chart I could see many connections between it and my client’s natal and solar return charts; including its IC and her solar return ASC being on the same degree and its ASC being my clients profected ASC for the year. I expect to see these types of connection between consultation charts and my client’s charts; this confirms the validity of the consultation chart to me. In blissful ignorance I continued analyzing the chart. Scorpio was rising; its ruler Mars was in the 12th house in Libra, between Saturn and the Moon. Mars was in a separating trine with Jupiter, sextile with Mercury and moving towards a trine with Venus. Both Venus and Jupiter were in Gemini and the 8th house. In fact Mars was in a partile trine to the cusp of the 8th. I knew that my client’s mother had died some 18 month earlier and that there were issues with her brothers relating to the inheritance, her assets and property. Mars being with Saturn Lord 3 (her brothers) and the Moon Lord 10 (her mother) and the emphasis on the 8th house, particularly as Jupiter was by profection, Lord of the year and exactly transiting her natal IC, I concluded that the whole situation surrounding her brothers and her mother’s estate was foremost on her mind and that she was finding it difficult; having problems taking action or making a stand on the issue as her significator, Mars was in detriment in the 12th house. Sure enough that first thing out of my clients mouth when she arrived was about her trip back home and the dilemma she was having feeling caught between her brothers; whichever way she went would alienate one or the other, yet she felt that both were looking to her to resolve the situation. In fact she really didn’t want to deal or even think about the whole issue, but knew that she could not continue to ignore it. The situation like all family disputes is complex and her brothers relationship is intense (Pluto is in the 3rd house). The appointment went very well as we explored many options related to her ability to figure out which approach to take. When she left I felt that it had been a very insightful and productive session, and then I looked at the consultation chart; it was not only the wrong date, but also the wrong time! How could I do this? Yet the chart “worked” in guiding us to the core of her issue, through which she found a possible course of action for her to follow. This was to take a more “spiritual” approach which is suggested in the chart by the partile sextile between the Moon (ruler of the 9th) and the Sun in its own sign in the 10th. Going back and setting the chart for the correct time, I could not see the situation nearly as clearly, though it could probably be extrapolated. 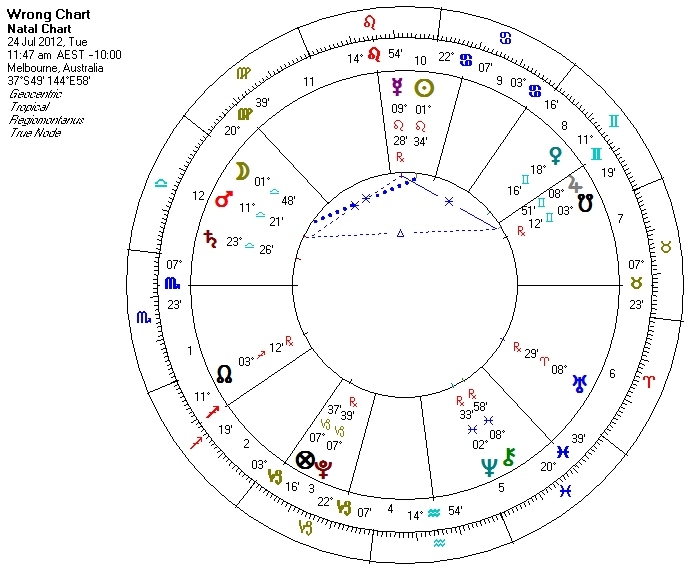 There are few connections between this “right” chart and my clients natal and/or solar return charts. Had I looked at this chart I would not have been drawn to conclude that she was dealing with her family’s inheritance issues. However Mercury’s aspect to Jupiter and the 9th house cusp, as well as his conjunction to the Sun does point to my client’s conclusion of taking a more spiritual approach to her situation. I am left with a sense of awe at the mystery of astrology! How can such specific information be drawn from a seemingly random chart? There is obviously some force at work which is beyond our control and that “knows” best.